Students of Kamala Nehru and Gargi College, along with representatives of the Residents Welfare Association (RWA) of Anand Lok, Gulmohar Park and adjoining areas came together to demonstrate against the rampant felling of trees and the ‘killing’ of footpath space in the area. Students and residents carried posters and display banners reading “Don’t kill our footpath space. Don’t kill us on the road” in the protest march from the Mithaas Complex in front of Gargi College to the Central Public Works Department (CPWD) office. The road stretch and the intersection near the college premises is already a congestion site and a traffic mess. Two trees have been cut and the CPWD plans to fell more and also break the pavement on both sides of the road, leaving barely any space for the pedestrians to walk on. The students of Kamala Nehru College, have protested in written to the DCP, South District, Delhi, warning that they will be forced to hold another protest march and jam the roads in front of the college in case the CPWD goes ahead with the tree-cutting drive. 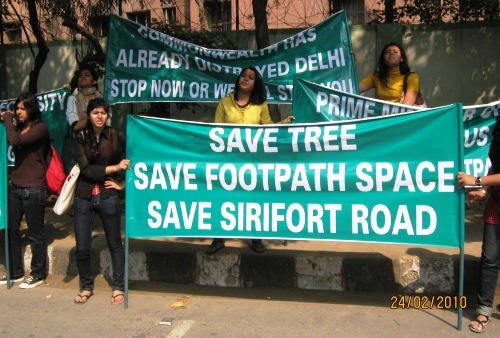 A similar protest in 2007, calling for immediate stopping of the indiscriminate felling of trees around the Siri Fort area was noticed but overlooked by the Government, on pretext of “planning” for the Commonwealth Games 2010. Two weeks of Commonwealth Games does not mean we sacrifice our environment and risk thousands of young lives. The Trees are a necessity, the pavements our right, is the message the students are trying to get across to the Government and the policy makers. Are these Commonwealth Games, or Games to take away are Common Wealth?…the question resurfaces yet again..
NextWishing You All A Very Happy and Thoughtful Holi!